The "obvious in hindsight" but I certainly never thought of that solution to the problem of defining a leak proof chamber by simply using an o-ring to both seal and define the chamber is wonderful. I would suggest using a piece of transparent plastic for the nozzle plate so that it is possible to see into the chamber easily. That will make extracting the air bubbles a bit easier. > make extracting the air bubbles a bit easier. I think Adrian approach is beautiful, because it's very quick, easy and cheap to 3D print, mainly because he (and most of us) already have a 3D printer. jump in, so much to do in the area of print heads. Edited 1 time(s). Last edit at 12/15/2010 05:44AM by johnrpm. This thread has been inactive for some time, but I hope someone will see this. I'm trying to jet a solution out of a DX4 head. There are 21 contacts on the ribbon, and each channel has 180 nozzles. How do the contacts correlate to the nozzles? For example, if I send current to 3 contacts, how many nozzles will fire? What I need is to be able to constantly fire about 30-50 nozzles. If I understand it correctly, the volume/droplet size will vary based on the voltage applied. What is the voltage range I should apply to each contact? Pearce, that is the kind of information that is not generally available, sadly. Basically, you'll have to ask the maker of the print head or reverse engineer the signals on a working printer. Have you complete any more movement on this project or is the project on hiatus? Nevertheless, good to see some movement in the direction of a totally DIY printhead! Another possibility is to modify the firmware on the printer. This has been suggested by Henry on other threads and on the DIY 3d Printer Yahoo Group. I know of no one yet who has actually reverse engineered a printer by modifying a piezo inkjet printer's firmware. I've pretty much stalled for the moment on this project. I have things I'd like to try out, but I'm not certain when that will I'll get back to it. I'm not aware of any other ongoing work by anyone else on the subject at the moment. Hopefully I'm wrong and someone will correct me. On a related issue Johnrpm has been working on a powderbed design. Any updates on progress? A friend and I are thinking about building one... And if it works, building an array. Just got twenty 10mm piezoelectric transducers off of ebay from zinky86. Hopefully tomorrow I will try powering them with my arduino and sparkfun ardumoto shield. I think it should work at powering the piezos. The delays, rise and fall times are in the micro second range, however that is with a resister. It will be something along the lines of what casainho has done. 1) 30-40 volts or so is good for driving the piezos (I don't know if you can use such a voltage with the board you have listed or not). Higher voltages might be useful just while starting out, but the higher voltages damage the piezos rather quickly. 2) Piezos on thinner plates seemed to work better than piezos on thicker plates (I believe they bend more for a given voltage than the piezos on thicker plates). 3) Any significant bubbles in the chamber make it almost impossible to eject drops. 4) Don't worry too much about rise and fall times. A simple single transistor or FET driver worked fine for me. 5) Controlling the amount of static water pressure above the nozzle is important. Too much and the nozzle leaks, too little and it is difficult to create drops. 6) I had the best luck with nozzles created by simply drilling a small hole through a thin piece of plastic (the more hydrophobic the plastic the better). I am certain that I'm not the only one that is very interested in reading about any progress or problems you run into. Thanks madscifi for the summary! I have read through all nine pages of this thread and have learned valuable information. The way I understand the function of these print heads is that the surface tension of the fluid you are trying to print is critical to keeping fluid from leaking through he nozzle. i.e. water has a high surface tension allowing for larger diameter nozzles. My friend has a laser cutter so we are going to try to make a print head out of acrylic with the smallest diameter hole his laser can "drill" through acrylic. He seems to think that he could drill a hole on the order of .1 mm or less. We are also targeting a small reservoir, on the order of 10mm diameter circle, 1/16" thick. After looking a commercial print head designs, the reservoirs are extremely small with the piezoelectric element deforming most of the reservoir. Hopefully this will allow for a higher pressure wave to reach the nozzle, overcoming the surface tension of the fluid, and allowing a drop to be ejected. Finally we are going to try to continuously flow fluid through the reservoir to "sweep" out any air bubbles that can come back into the reservoir when the piezoelectric element retracts. Glad to see you are doing some work on this, Madscifi has a lot of experience and his advise is good, I like your idea of constant flow to remove bubbles, keep at it, I shall follow your progress with interest. P.S the video is good, explains the shear mode well. Got a question though, any tricks to solder wires to these? I broke two of them (third times the charm! 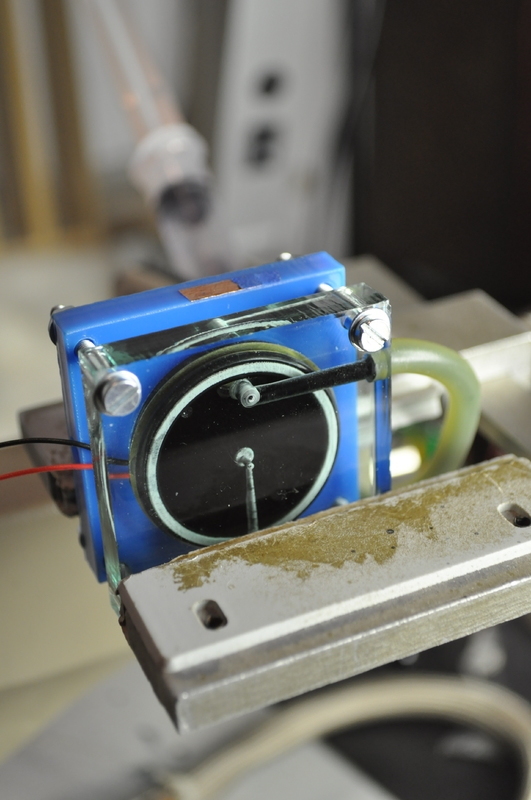 ), the piezo material seemed to de-laminate from the brass. I love to see pictures :-) -- thanks for sharing and good luck on this project. I would like to say I am monitoring this thread, for the development. Edited 1 time(s). Last edit at 12/20/2011 05:01AM by casainho. pull off, some piezo buzzers can stand a fair bit of abuse, whilst others die at the least excuse. Edit: I use lead solder, can not get on with unleaded. Edited 1 time(s). Last edit at 12/20/2011 06:23AM by johnrpm. If you can know the manufacturer of the specific disks you can probably find their recommended soldering instructions. There are some new MEMS Industrial Printheads with ~30pL drops and 16 nozzles for ~$100. I'll try and see about availability for DIY and how to publish specs on controlling them. They might fire at up to 50khz and handle fluids in the 8cps to 20cps range. Any updates? I am extremely interested in this. My buddy got several sheets of poly-carbonate that we will soon be using to fabricate a print head. Hi Awais - I think the whole community would find that extremely interesting. Would you consider creating a page on the wiki? Thanks bies for extending my idea. Thank u so much. Seems to be great device. Has anybody tried that one? Would it work as Drop on Demand setup with micro dispensing nozzle? I just add my personal experiments to this collective research.. I'm interested in making an actual plotter / printer without using existing cartridges.. Therefore I'm trying a setup stacking more piezos in vertical. I'm using 35mm piezos. The resolution I obtain is 0,25 mm drops, which means around 100 dpi. It is fine for me as I want to use it for large format printing for now. I'm using the facilities of the Fablab Amsterdam, so I have access to nice set of tools. In this prototype I used as a nozzle a copper foil used in general to cut circuits from and drilled the hole with a 1/100 inch. The body is made of transparent PMMA (Acrylic) which I drilled holes into, so I could see what's going on in the head (ink level etc). The problem I'm facing now is that when the piezos are vertical, the pressure from gravity is too high and the head just starts making big drops out of the nozzle. Only with a negative pressure in the ink chamber I'm able to make proper drops with the piezo. That's a common problem that inkjets manifacturers have to solve as well.. I know HP uses a membrane in their cartridge which contains the ink and a sponge like structure, therefore this sponge pushes the sides of the membrane creating the negative pressure. I should open a commercial cartridge to check how they do it. In the mean time I'm constructing a big bulky mechanical system with stuff laying around, to set the pressure in the meantime to do tests. 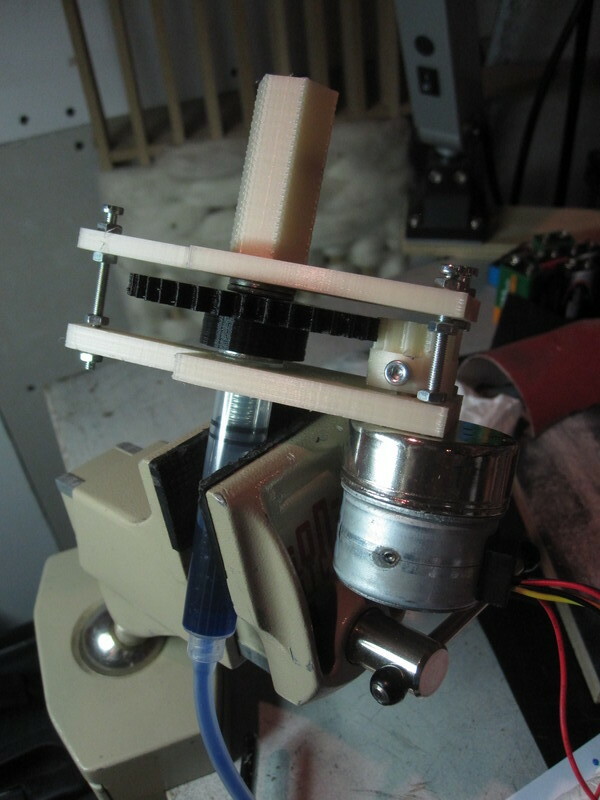 It is basically a stepper motor pushing and pulling the plunger of a syringe connected to the ink system. When it pulls out it sets a negative pressure and viceversa. I'm also gonna get hold of a pressure sensor so I can calculate what negative pressure I need and then try to find a cheaper and simplier system to set it. Hope the broken english reading was interesting and maybe to get some tips on how to achieve the pressure. Regular maintenance for printheads. If you use your printer once in awhile, you will probably get ink buildup inside the printhead which will eventually clog the head or cause nozzle deflections. If you use your printer constantly, you will probably get some buildup on the inside of the head and more buildup on the outside which you need to remove from time to time to keep your printer from leaving messy droplets and streaks on your prints.